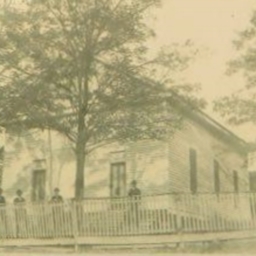 Photograph showing Solomons Lutheran Church located near Moores Store in southwestern Shenandoah County. 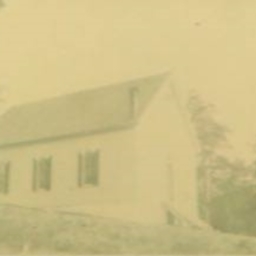 The reverse of the photograph is labeled "Soloman's Church- Grandmother & Granddaddy went here until 1928 due to common communion cup." 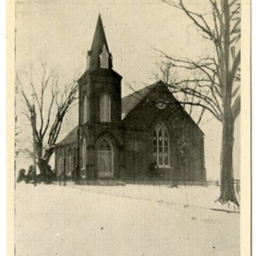 Photograph of Reformation Lutheran Church located in New Market Virginia. 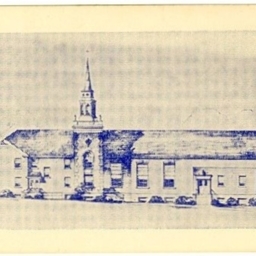 The picture was featured on dedication program for the newly constructed church which was held on June 17, 1956. 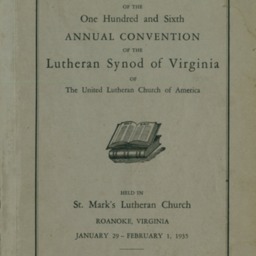 Cover page and last page of the Minutes of the Virginia Synod of the Lutheran Church, held at St. Mark's Lutheran Church in Roanoke Virginia. 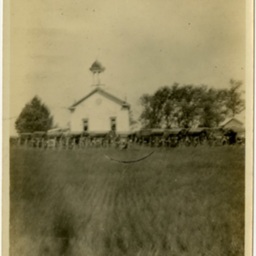 Photograph of Mt. 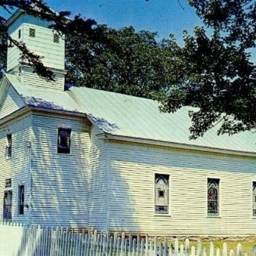 Zion Lutheran Church located in Fort Valley Virginia. 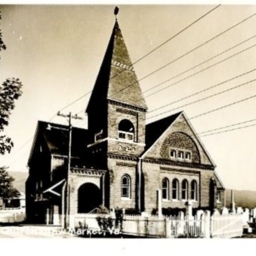 The church was constructed in 1897 by a group of dissidents who left the St. David's Church Congregation. 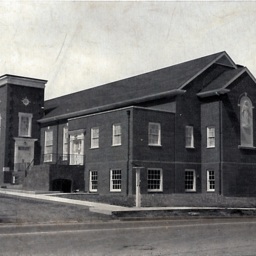 The two churches would reunite in 1965. 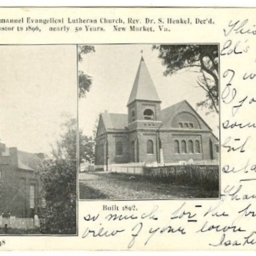 Postcard showing the Rader Lutheran Church near Timberville Virginia with historic dates and pastor's names. 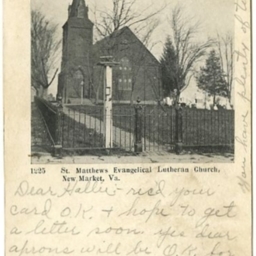 Lutheran Church- New Market, Va.
St. Matthews Evangelical Lutheran Church, New Market Va.
Postcard showing St. Matthews Lutheran Church in New Market Virginia. 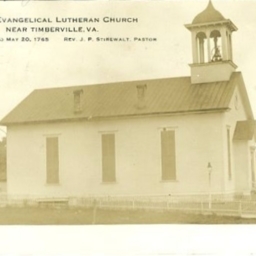 Located on the same site as the current Reformation Lutheran Church. 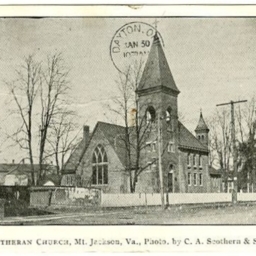 Postcard showing St. Matthews Lutheran Church in New Market Virginia. 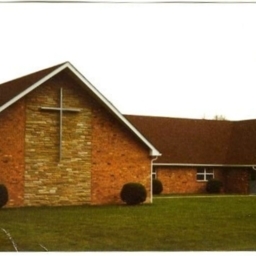 Located on the same site as the present Reformation Lutheran Church. Mt. 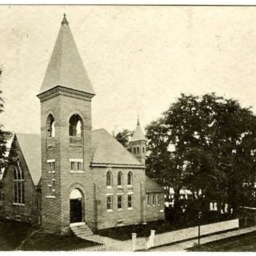 Calvary Lutheran Church, Mt. 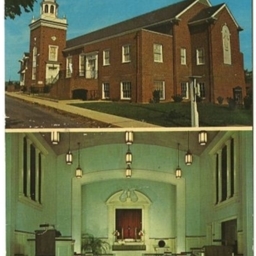 Jackson, Va.
Postcard with a color picture of Mt. Calvary Lutheran Church located on Main Street in Mt. Jackson Virginia. 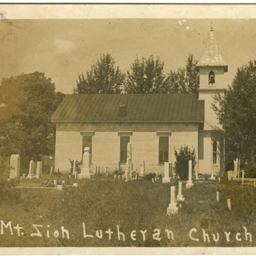 Lutheran Church, Mt. Jackson Va.
Postcard with a picture of Mt. Calvary Lutheran Church located on Main Street in Mt. Jackson Virginia. Mt. 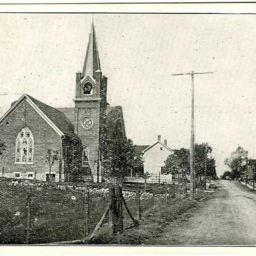 Calvary Lutheran Church, Mt. 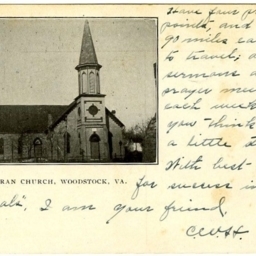 Jackson VA.
Postcard with a picture of Emanuel Lutheran Church located in Woodstock Virginia. 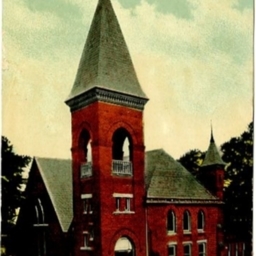 It includes a description of the church and its history. Postcard with a picture of Mt. Zion Lutheran Church and cemetery taken from the east exposure. Located west of Woodstock Virginia in the Fairview community. 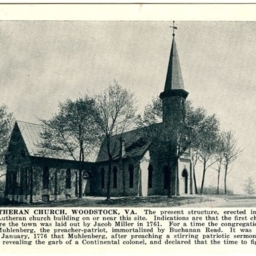 Postcard with a picture of Emanuel Lutheran Church in Woodstock Virginia. 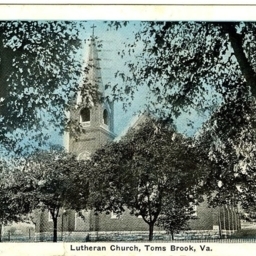 Lutheran Church, Toms Brook, Va.
Postcard with a picture of St. Peters Lutheran Church located on Main Street in Woodstock Virginia. 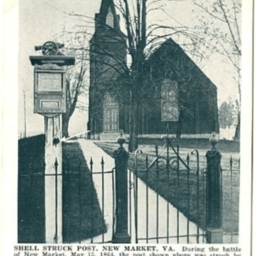 Main Street looking north, Tom's Brook, Va.
Postcard showing a picture of Main Street in Toms Brook Virginia. St. Peter's Lutheran Church is visible. 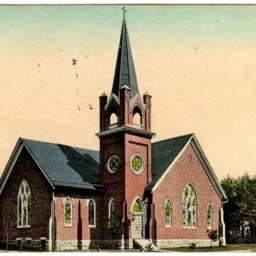 St. Peter's Evangelical Lutheran Church, Main St. Toms Brook, Va.
Color postcard with a picture of St. Peter's Lutheran Church in Toms Brook Virginia. 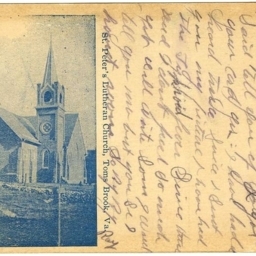 St. Peter's Lutheran Church, Toms Brook, Va.
Postcard with a picture of St. Peter's Lutheran Church taken from the south.